This wedding season get inspired by cute makeup ideas and sport a lovely look on your BFF’s wedding! If you have seen Ariana Grande then you know exactly what we are hinting at. Her stunning no-makeup look with a sharp cat eye will make you look desirable and supremely cute — all at the same time. To get the look right, hydrate your skin with light Argan oil, and then layer it with a good primer for a smooth surface and to make your makeup last all day. Besides a light foundation primer for your face, apply a colorless eyeshadow primer on your eyelids. Now your bronze eyeshadow will not crease at any point during the day. After the foundation, powder, bronzer, blush and highlighter, go for a chocolate-color eyeliner to create the winged eye that goes towards the brow. Keep your lips soft, natural and peachy and you’re ready to seize the day. A line of shimmery electric blue over your shadow, or thick dashes at the top and bottom corners of your eyes with a turquoise blue pencil and you don’t need to put in much effort. 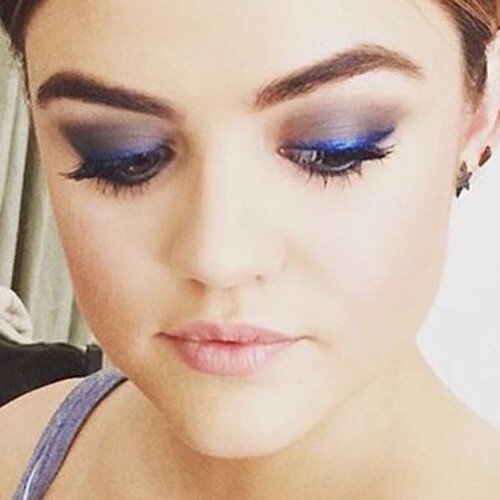 It’s time to experiment with color and liven your cute look, much like Lucy Hale and Vanessa Hudgens. Keep handy your stash of colored eye pencils and accentuate your water line or your lower eyelashes. Go for a striking blue or a neon green for the eyes. You can also brush the bold shadow under your eyes or. Pair this with a neutral shade of lipstick and a soft blush to your cheekbones – brightens your face and makes a statement. Look like an effortless beauty with a subtle and clean look that doesn’t look enhanced through makeup: think Selena Gomez. Accentuate the eyes by adding definition to the lash line. Choose soft browns, taupes or gray in pencil for the eye crease and a light eyeshadow, say creams, beiges, and pinks, to even out the lid. If you have long lashes then a clear mascara would be sufficient or else, go for a thin coat of a brown or black mascara. To get the natural blushed effect, on the apple of the cheeks apply either cream or powder in pink or peaches. Use lip stain or a lip moisturizer, with a light matte or sheer lipstick in a natural tone, to get the desired attention.